CGR-D54 is an extra large size after D320. It should last for 8-10 hours of recording vs 6-8 that D320 is designed for. 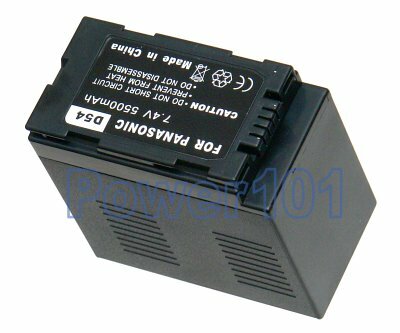 This battery is compatible with Panasonic AG-DVC20P, AG-DVC30, AG-DVC30P, AG-DVC60, AG-DVC7, AG-DVX100A, AG-DVX100B, AG-HVX200, VW-VBD55. 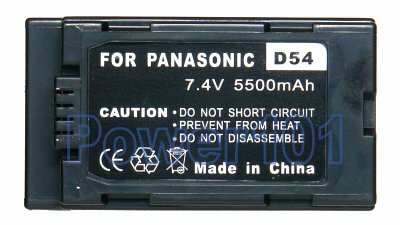 Please check your camcorder in our compatibility list to find the battery you need. These batteries can be charged by any standard chargers compatible with D120 or D220 or D320 or D08A or D16A or D28A or D53A or D54A. Such as the charger that came with your camcorder. They can also be charged on the camcorder.